Capital outflows from Russia tripled in 2014 as the country plunged into an economic crisis. Vladimir Putin is trying to bring Russian money back home. The Russian president has granted an amnesty to people who come clean about the cash they stashed offshore before Jan. 1 -- provided they bring the assets back to Russia, or at least move them out of tax havens. The new law, signed by Putin this week, is part of a package of measures aimed at keeping more of Russia's wealth in the country. Businesses and wealthy individuals who choose to declare their foreign assets before the end of 2015 will avoid the risk of prosecution and a bill for tax arrears. 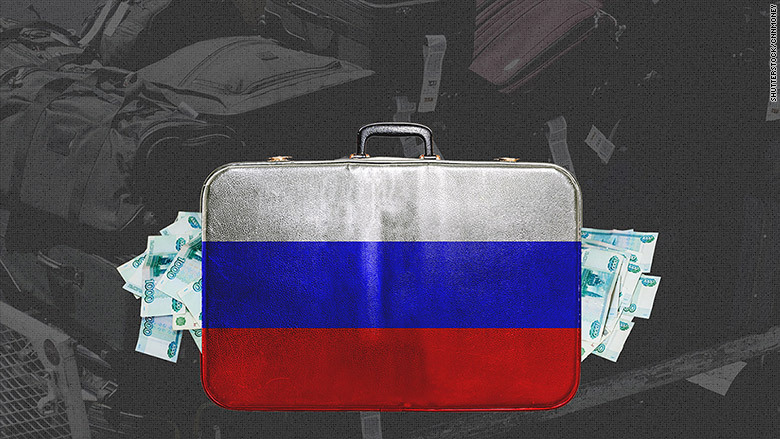 Billions of rubles are fleeing the country every month as rich Russians try to protect what remains of their fortunes after the deep economic shock of 2014. Capital outflows from Russia tripled in 2014 to $151.5 billion, the highest amount ever recorded. And 2015 is not looking much better, with $32.6 billion fleeing the country in the first quarter, according to the country's central bank. As Western countries slapped Russia with sanctions over its involvement in Ukraine, the amount of cash leaving the country skyrocketed. To try to stop the bleeding, the Russian government passed a law requiring business owners to pay taxes in Russia -- regardless of where their company is based. Some of the offshore money often finds its way back to Russia, but under the radar of the tax authorities. In a report published last month, KPMG estimated that about 75% foreign investments into Russia come from countries perceived as tax havens.